PF Chang’s Mongolian Beef Recipe is the easiest way to have a flavorful and delicious restaurant style dinner at home in 30 minutes! There is no secret that we love Asian dishes, and Mongolian Beef is high on the list. Due to our passion for this dish, we decided to create a few variations on it. We have the popular Instant Pot Mongolian Beef, followed by Instant Pot Mongolian Chicken, and lastly Instant Pot Mongolian Drumsticks. This PF Chang’s Mongolian Beef Recipe has been a long time on my to do list. Over the weekend we went to PF’ Chang for lunch and had a bunch of dishes, and the Mongolian Beef was one of them. I must say that it was an instant favorite, my husband requested that I make PF Chang’s Mongolian Beef Recipe immediately, he loved it so much! 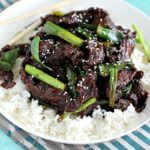 Make Mongolian Beef in the Instant Pot if you want! 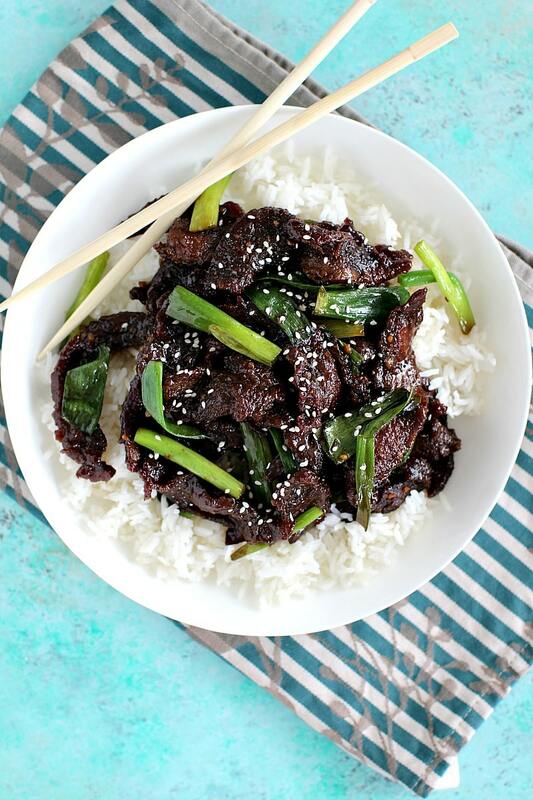 This Mongolian Beef Recipe is one of the easiest copycat recipes you can make at home. It requires simple ingredients, that you probably have on hand. If you like Asian inspired dishes like we do, this is a must try. 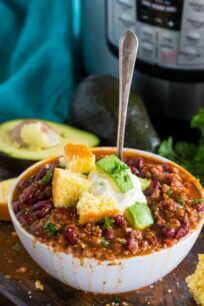 The recipe comes together in 30 minutes, so basically you can have a restaurant style dinner ready in 30 minutes. Use quality meat. I always say this, but a good meat centered meal starts with quality meat, preferably use organic beef for this meal. Best cut of meat for Mongolian Beef is a flank steak, it is also easier to cut it into thin strips. I used a LOT of garlic in this recipe. We love garlic in our family and I think it works really well with the sweet and salty flavors. Feel free to use less if you are not a huge garlic fan. 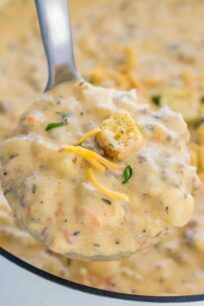 Can I substitute chicken for beef for this dish? 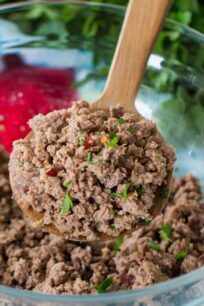 Yes, chicken or pork is a great alternative for beef in many recipes including this one. The cooking time will also vary best on the cut that you choose. Chicken recipe can be found on Instant Pot Mongolian Chicken. 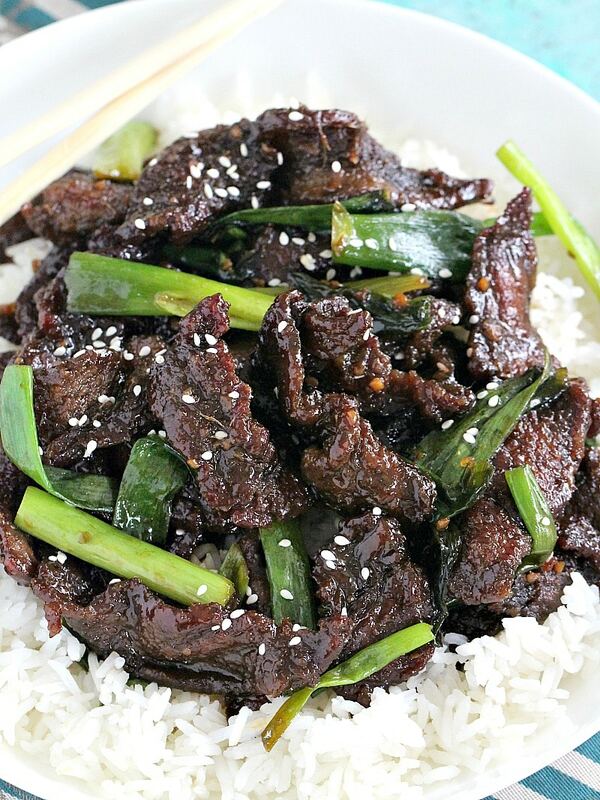 What is best to serve with Mongolian Beef? What wines pair well with Mongolian Beef? 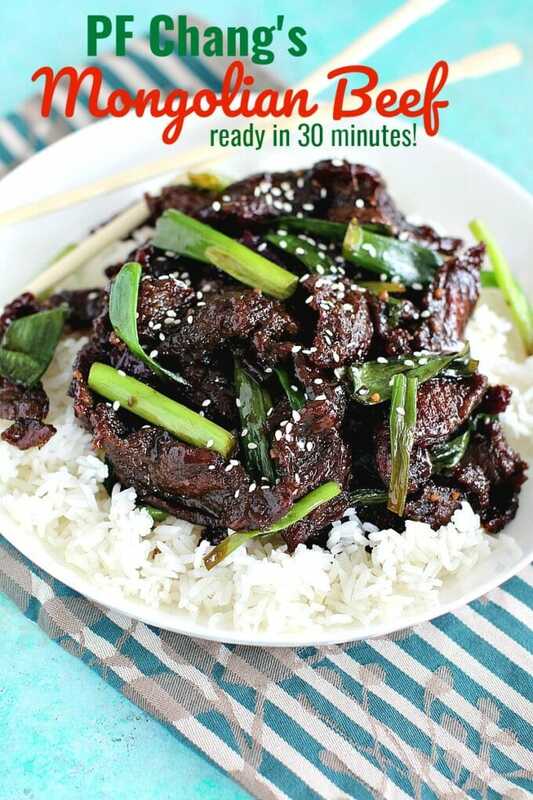 PF Chang's Mongolian Beef Recipe is the easiest way to have a flavorful and delicious restaurant style dinner at home in 30 minutes! In a medium sauce pan over low/medium heat add two tablespoons of vegetable oil, followed by the garlic and ginger, cook and stir for 30 seconds and whisk in the brown sugar, soy sauce and water. Cook until slightly thickened, about 5-10 minutes, set aside. Add the sliced flank steak to a large bowl and mix with the cornstarch until the cornstarch is evenly distributed. Heat 1 cup of vegetable oil in a large saucepan, once hot add beef and fry until browned and cooked through, about 1-2 minutes. Stir the meat around a little so that it cooks evenly. Transfer beef to a paper towel-lined plate and discard the oil from the skillet. Add beef back to the skillet, add the soy sauce mixture and cook over medium heat until sauce thickens, about 2-3 minutes. Stir in green onions. Garnish with sesame seeds (optional). I tried this last night and it was absolutely delicious !!!! it was very easy – I stuck to the exact portions based on the recipe and paired it with Jasmine rice. I was not disappointed and will be making this again! Yes, you need so much oil to kind off deep fry the beef, you want it to cook evenly, after you fry the beef, you discard the oil. But you need that much for the frying process.